Rigo Ramos takes the hill for Archbold Tuesday versus Napoleon. In his six innings of work, he struck out 13 batters while surrendering just one hit and two walks. 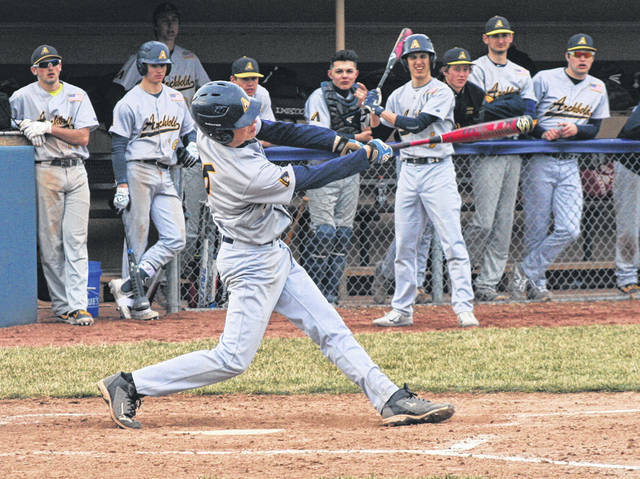 Archbold’s Jeron Williams drills a double to center field in the bottom of the fourth inning Monday versus Napoleon. The Blue Streaks shut out the Wildcats 10-0 in six innings. T.J. Rice of Archbold crosses the plate for a run during Tuesday’s contest. 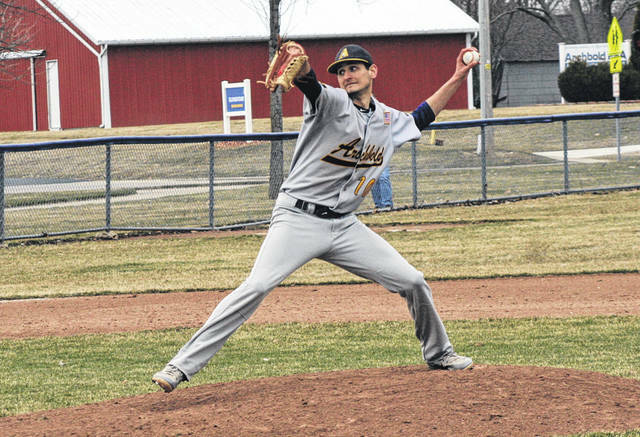 Following up an impressive shutout win over Hilltop Monday, Archbold blanked Napoleon 10-0 in six innings on Tuesday in a non-league baseball contest at Memorial Park. 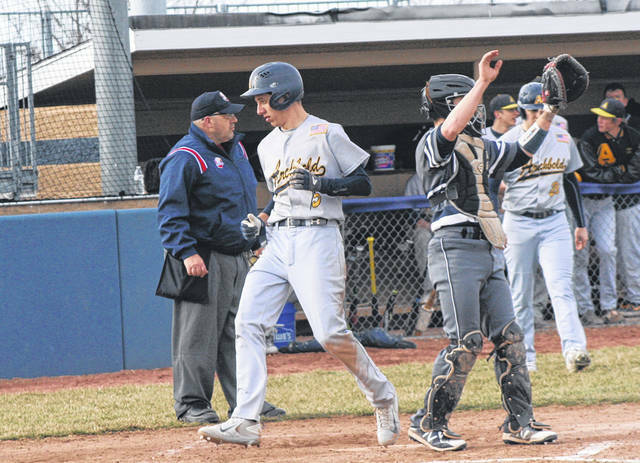 The Blue Streaks got a clutch performance from senior pitcher and BGSU commit, Rigo Ramos, who allowed just a lone first-inning base hit while striking out 13 Wildcat hitters. With the game only going six innings, only five Napoleon outs weren’t via the strikeout. Archbold started the scoring in the bottom of the second inning. They got a walk from Mitch Grosjean, plus a pair of one-out singles from Cory Erbskorn and Kreighton Sims. Following a strikeout for the second out, Grosjean scored on a passed ball to give the Streaks a 1-0 lead. Clay Nafziger then legged out an infield single that also scored Erbskorn for the second Blue Streak run. A passed ball would bring home Sims, then Jeron Williams’ RBI single made it a 4-0 game. Williams closed the scoring in the frame when on Kade Kern’s ball in the infield, he rounded third and scored after the Wildcats’ throw to first to get Kern was unsuccessful. Archbold then tallied four runs on four hits in their half of the fourth. With runners on second and third after a Williams double, T.J. Rice executed the suicide squeeze to perfection scoring Nafziger from third. Also, the throw to first was not in time and assessing the situation, Williams took a chance and strolled home as well. The Streaks added a run on a RBI single from Grosjean, plus Holden Galvan’s fielder’s choice plated another to make the difference 9-0 through four. They stranded a pair of runners in the fifth, but in the home half of the sixth, the first three batters reached with the third being an Aidan Warncke’s pinch-hit single which brought home the game’s final run. The night before, the Streaks picked up a 17-0 win over Hilltop in a game also held at Memorial Park. Archbold (3-1) next welcomes Ayersville Friday and Elmwood on Saturday.